ABOUT a month ago, I moved into my fourth apartment abroad here in Namibia. And listen, as a foreigner, apartment hunting in Africa has taught me so much! So, if you’ve been feeling overwhelmed about how to find an apartment all the way in Africa, hear me out. Finding a place to rent on an entirely different continent can be extremely intimidating (even for an eight year Africa expat like myself!). But I don’t want you to allow your overwhelm to stop you from experiencing all the goodness of life on the African continent. Are there some differences between apartment hunting in Africa and the West? Yep! However, finding an apartment (aka a ‘flat’) in an African country is a lot easier when you know what to look out for. And luckily for you, I’m about to break it all down. Here’s everything you ever wanted to know about finding an apartment in an African city. When it comes to living in Africa, we all have our own tastes. So even if 99.9% of all the expats you know are living in capital cities, it doesn’t mean you have to (I don’t!). When looking for an apartment in Africa, start out by thinking about your own personal preferences and your budget. Here are a few more factors to consider as you narrow down an African community. Location. African capital cities are generally the most expensive areas of a country to live in. The further you go away from big cities the cheaper rental costs become. Crime stats. Larger African cities generally have more crime. But that doesn’t mean you have to avoid living in them either. We’ll talk more about apartments and security in a few. Accessibility to taxis/transportation. If you won’t have a car or don’t have your driver’s license you may want an apartment near public transportation. Proximity to shops, supermarkets, etc. How close do you want to be to shopping areas? Within walking distance? The type of community experience you’re looking to have. What type of neighborhood would you be most comfortable in abroad? Urban, rural, suburban? Busy with tons of activities to get into or is quiet more your speed? Proximity to places you’ll visit often (job, good schools, universities, childcare). If you and your kids are living abroad for the first time, you might want to live near the best schools. Or, you may want to live close to your job or study abroad program. Outages? In some parts of Africa, electricity and water outages are frequent. However, as a native New Yorker I can confidently tell you they’re really not the end of the world. However, especially if you work online, they can definitely be an inconvenience. If you think you can’t deal, look into areas with the least outages. So where can I find African apartment listings? In the States, searching for apartments is as simple as hitting up apartments.com and typing in the city of your dreams. Well, when it comes to finding an apartment in Africa, it’s not always that simple. Now, some African countries do have thorough real estate listing websites. However, many do not or if they do, the database of listings isn’t updated regularly or a lot of landlords don’t even use them. But do not be deterred. There are several other informal but super useful ways to find the right crib. Check out the following routes below. That’s right. If I were you my first stop would be either Google or Facebook. Start searching the web for phrases like “for rent in Accra” or “two bedroom flat in Cape Town”. Keep in mind that “flat” is a common term used in some English speaking African countries for “apartment”. After you start searching, you’ll quickly find Facebook real estate and marketplace pages and groups, as well as real estate websites on Google. All of these places list apartments for rent. Realtors may not be the ones marketing the flats as in Africa, it’s often owners as well. You should also feel free to shoot the renter a private message for more photos or additional questions. While you may not find the perfect place right away, the internet is a great place to get a feel for what your money can get you around Africa. Can’t remember the last time you touched a physical newspaper? Well, around Africa, classifieds sections in newspapers are still king. Many African newspapers have a specific day of the week when the bulk of apartment listings are published in the paper’s classified section. In many countries, this is the Friday paper. Finding apartments through the papers is generally easier for folks already in-country with the access to purchase newspapers. And although many African newspapers are now online, many do not publish their classifieds section on the web version. But even if you’re just in Africa for a visit, grab a newspaper and keep an eye on what’s for rent. Depending on the country you’re in and how hot it’s housing market currently is, apartment listings can go fast. That means if you see a place you really like, don’t procrastinate on calling the landlord and make sure you have your deposit (if it’s required) saved up too. Tip: Notice boards in supermarkets, on telephone poles at popular street corners, and other spots with a lot of foot traffic are also prime places for apartment listings, so as you’re walking around town, watch for these as well. This is a really useful way of finding an apartment in Africa. Hit up everyone you know in-country (locals and expats) and tell them you’re looking for a place to live. You’d be surprised at how many folks know someone who knows someone with a place to rent. Plus, there’s more trust built in with friends of friends and your connection might give you room to bargain on rental costs as well. This is exactly how I found the spacious two-bedroom I just moved into a few weeks ago here in small town Namibia! So, I’m currently a member of a business WhatsApp group where all things business related in my town are shared. It’s basically a mini-marketplace for the town I live in. Group members share everything from their new swimming lessons business to the house they just put on the market. So how do you find these gold mine groups? Let’s say you’re seriously considering moving to an African country, but you haven’t even been to Africa yet. Start mingling with people on social media in the country you’re eying up (Facebook is a great place for this). Now, I’m not saying to be a creepy internet stalker type. But you can totally connect with like-minded Africans and ask them for the best Facebook business or real estate pages. You should also search for, “like”, and follow Facebook pages about business or real estate in the country/city/town you’re considering. You’ll find that many of these pages have have associated WhatsApp groups. Don’t have time to apartment hunt? Find a local real estate agency and let them handle it for you! This might involve you paying an additional fee to an agent. One thing I’ve noticed is that realtors often prefer to sell higher priced rentals to make larger commissions. So, if you’ve got a really low budget, this may or may not be the best route for finding cheaper apartments. There’s nothing worse than your dream space becoming a nightmare after you move in. That’s why you need to ask all the right questions before you make your decision. As a foreigner, it’s very easy to miss asking important rental questions simply because they wouldn’t necessarily apply in your home country. And sometimes your prospective landlord simply may omit things that could prevent landlord-tenant disputes later on. However, asking the following questions can help you avoid any ugly surprises down the line. Do you have a contract/lease for me to sign? A rental contract can be great protection against apartment rental fraud and it just makes sure all parties are on the same page. Although, depending on where you are in Africa, a landlord might be pretty relaxed about providing a lease. I’ve heard that in some African countries you’re required to put down a year’s worth of rent as a deposit?? Yikes! Here in Namibia, the norm is either one month’s rent or none at all (my current scenario :) You should also find out what the terms of getting your deposit back when you leave are (how much notice is required and how long do you have to live there?). All of this should ideally be detailed in a contract or lease agreement. Will you put on a fresh coat of paint? If the walls are looking kinda smudgy, I’d ask. Although, over the years I’ve noticed some landlords don’t care much about the upkeep of their apartment. I think the best ones make sure the place is in good shape when you move in and out. A broken gate, faulty electrical current... after you’ve carefully walked through an apartment, ask your landlord about getting anything that needs fixin’, fixed. One thing I’ve learned is that some landlords fabricate. These folks will say anything just to get you in the flat and then after you move in the broken promises come flooding in. However, chatting with another tenant can give you the real tea about if the landlord makes good on maintenance. While a fridge, stove, and washing machine may be the norm where you’re living, they may not be included in an African apartment. So, don’t be fooled by what you see when you view the place. The furniture and appliances could actually belong to the tenant who's about to move out. And that means you’ll have to budget for a whole lot more than your deposit and first month’s rent. If you’re low on cash and can’t afford a whole stove, look into getting a small toaster oven stove unit. These are sold all over Africa and are pretty affordable too. What I’ve found is that the more high-end you go, the greater the chances of having appliances included in the apartment. Some apartments around Africa are more internet-ready the others. In one flat hooking up your internet might be as simple as plugging in your modem. Yet another might require a whole phone line to be installed (which could take weeks). Or, maybe the neighborhood doesn’t even have any internet network yet…period! If you’re moving to Africa as an online freelancer, that could be problematic. Is water and electricity included? Ask the owner which utilities will be included in your monthly rental fee. You also want to find out where to refill and how easy it is to do. In some apartments in Africa, you can refill your own water and electricity by buying more credit at a local shop (e.g. gas station) and then refilling the meter back at your flat. In my experience, living relatively close to 24/7 refill stations or using cell phone services to pay utilities are the easiest methods. Oh, one last thing! If you’re a sucker for hot showers, don’t forget to ask about the hot water situation! In my old apartment, I had a geyser which had to be switched on about thirty minutes before I showered if I wanted hot water. While in my current place, we’ve got automatic hot water. Yasss! Cabinets are pretty standard in apartments back in the States, but here in Namibia it’s common to find a whole apartment with no kitchen cupboards. Luckily, portable wall unit cabinets are sold everywhere here but I find them clunky and unsightly. The same goes for storage and closet space. You can find entire bedrooms in African apartments with no closets at all! Portable wardrobes are sold here too, but again, I find them to be awkward. There’s really no replacement for good ‘ole closet space. Are you moving to Africa in search of warmer weather? Well, bugs love warm climates too and since a good chunk of the continent is hot…well, you get my drift. Insects are really thriving this side of the planet. As with anywhere in the world, the more upscale your apartment, the less chances you have of dealing with an infestation. And, if you’re browsing an apartment and notice what looks like dustings of pepper all over counters and cabinets, surprise! It’s roach feces, a sure sign those guys are lurking around. Depending on where you are termites can quietly take over a flat too. If you happen to move into a place with a problem, just hire an exterminator (been there done that and it worked like magic!). I would also ask locals for their recommendations on what products work the best too. Is the norm for flats in your home country multiple wall outlets per room? Then you could easily forget to check for this in an apartment in Africa. I have definitely viewed apartments that simply didn’t have enough outlets. So be sure to look around for these! Because extension cords scaling across your apartment ain’t cute. What if you’re moving to an African city with frequent home break-ins? Then try to pick a place with a security guard, electrical fence, or at the very least iron gates/bars on all doors and windows. I recently viewed an adorable spanking new apartment complex that was unfortunately dealing with daily break-ins (rumor has it it was an inside job!). This could have easily been prevented by the landlord hiring round the clock security guards. If your front door isn’t the sturdiest or seems like it’s lock is very pickable, ask your landlord about putting up an iron gate door and lock that with a good ole padlock. If they don’t agree to pay for this, just cover it yourself—trust me, it’s worth your peace of mind! Don’t just look at the apartment itself—take a look at the premises too. Are the garbage cans neatly lined up and emptied? Or are they overflowing with trash and looking like they haven’t been emptied in weeks? Do the gardens of the property look maintained or unruly? And remember that flat I mentioned just above with the break-ins? The fact that the property owners didn’t seem to care about robbery prevention was a huge red flag. How well a property is maintained is often a direct reflection of how great your landlord will be. In Africa, drying clothes outdoors on a clothes line is a common setup. And those sun rays are a lot cheaper than buying a whole drying machine too. So, when apartment hunting in Africa, make sure there’s a few lines already set up or at least a good space for you to hang one. The best spots are preferably away from dirt patches or the road to keep dust from getting on your clothes. quick tip: watch out for scams! Sadly, rental scamming in Africa is a thing (as everywhere else in the world). Have you found a too-good-to-be-true studio for rent in Kenya on Facebook? DO NOT transfer money to the seller without at least seeing the place first! And actually, you want to meet the actual owner before paying a dime. Take safety a step further and only pay your deposit when you get your keys (and have tested them out). Have some suspicions? Snoop around and ask the neighbors if the owner is really the owner. It’s always good to get a lease and to sign it with the landlord, in person. However, remember, depending on which African community you’re looking at, renting can be more informal and relaxed or handled through a realtor. I’ve found my own African flat! What are my next steps? Already got a job lined up on the continent? Nice! If you don’t, look into these work in Africa opportunities. Are you moving to an African country without a work visa or job lined up? Heading on a fact-finding trip to get a feel for how you could make life abroad work? Research what the immigration requirements are for you to legally stay in the country. Many countries grant tourist visas that allow you to stay in-country for several months. That might also mean finding a landlord with flexible rental options and no one-year contracts. Watch this video tour of one of my old apartments here in Namibia! If you somehow stumbled upon this article and simply have no clue about which African country would be best for you to visit or move to, then read this! 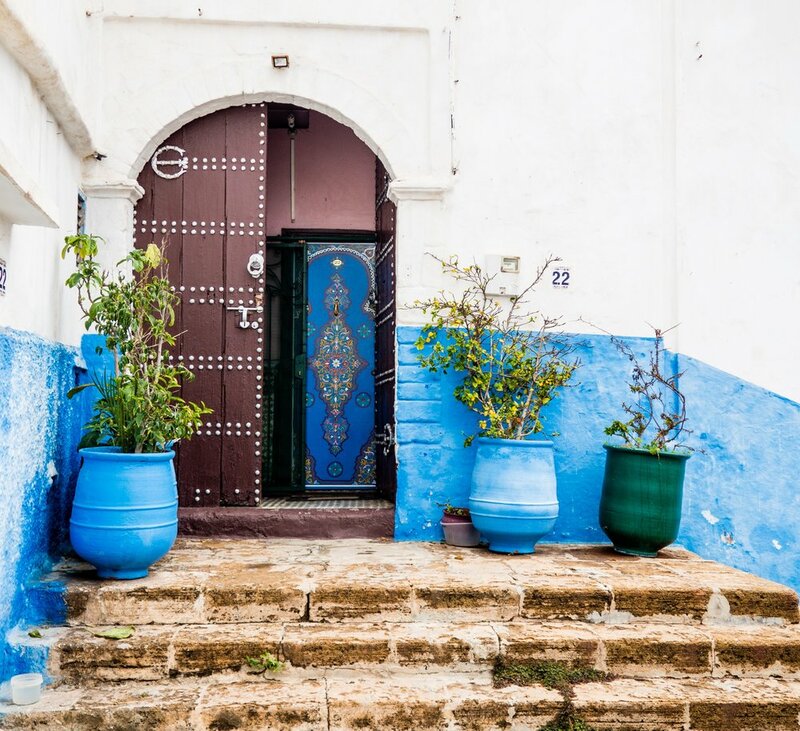 If you’re living (or have lived) in an African nation, share your apartment hunting tips, resources, and experiences with us in the comments below!